Country: European bootleg DVD (silver). DIGI-PACK cover. Comments: The BEST quality available so far of this show. 'New' source. Nice fold-out Digi-pack full color cover. 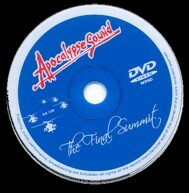 This DVD begins with a scene from “Apocalypse Now”, accompanied by the Doors “The End” in nice surround sound, to introduce the producer of this title, which is a total winner. 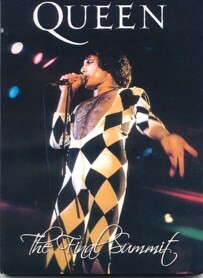 The show takes place at The Summit in Houston, Texas, on December 11, 1977, and Queen were very much on their game that night. Beginning the performance with the faster, live version of “We Will Rock You”, the visuals are pretty clear and not too blurry. This is something, given the age of the recording. The audio, which is described on the DVD case to be Dolby Digital 2.0, is excellent and perfectly synched with the visuals. Although there are many, many highlights in this concert, it is rather obvious that the star of the show is Freddy Mercury. He rightfully commands your attention from the beginning, front-and-center, and flawless. From his beautiful piano playing (which is displayed wonderfully to begin “The Millionaire Waltz”), to some vocal displays that are simply breathtaking (as found in the trippy, and echo-laden, solo he does in “The Prophet’s Song”), Mercury was the ultimate showman. And his continuous wardrobe changes through the show exemplify this, with a holographic one-piece suit worn during the last couple of songs (”Sheer Heart Attack” and “Jailhouse Rock”) that made him look as much like a human disco ball as it did anything else. Brian May’s performance is also excellent throughout, as is Taylor and Deacon, but there is little doubt that Mercury made Queen so special. This great DVD title puts this truth on full display. The DVD comes packages in an attractive bi-fold, heavy paper case that is decorated with glossy pictures from the show. 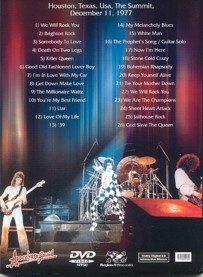 The opening menu cycles the studio version of “We Will Rock You”, giving the viewer the option to play “all songs” or select which song to play. As mentioned above, the audio is excellent and matched perfectly to the visuals. I find this to be an incredibly important finishing touch that too many producers of DVDs miss, to the detriment not only of the collector, but the show as well. Apocalypse Sound have done an excellent job with this title, which is highly recommended for any music fan, whether or not you love Queen. As a side note, it has been rumored for ages that footage exists of Led Zeppelin’s show at The Summit on May 21, 1977. As the soundboard of that show has been released to the collecting public, it would truly be a wonderful day if the film is of the quality found on this Queen show. Only time will tell if we get to see a “final summit” of Zep’s show earlier in 1977.